The latest photos are off the chart. I like the reefmutt watermark too. One of my pink matrices and jf Flame sort of in middle..
Here’s OP on left, a new acquisition from Fragbox called blue monster in middle (I leeerve blue monster) and red diablo on right lower down.. oh and pink lemonade upper left.. I really love this shot.. op, blueberry wine and no name coral..
Blue.. need some blue. I’m on a quest for blue corals.. this guy next to su is growing well..
Another angle next to a bonsai wannabe..
Mmmm this photo dump is so cathartic!!! I have a few more..
Its so good to see these pretty colours on the SPS. I'd love to see a top down video of the corals in HD; that would be a treat. I did say some time ago maybe when you started the thread that you'd produce these sorts of results. And you havent disappointed one bit my friend. Keep up the nice work. Really nice stuff Matt, well done again! everything is looking great. where is your alk now? I will have to do some research on the bipotim but it looks like I would have to use 5 every 2 weeks or around 12 a month? Hey Cody, alk is right around 7.. it had dropped several weeks ago to below 6 because my kalk doser got an air bubble in the line and slowed down. I just though it was my ca reactor not keeping up so I increased co2, then a couple weeks later I realized that the doser was slow, so I fixed that and saw alk go up to 8.. after cutting back a bit, I’m now stable at 7 ish. As for Bioptim, I have only been dosing an ampule every Saturday and Wednesday in my 350 gallons.. so, 4 every 15 days.. however, I’m thinking of adding a third ampule in there somewhere since my tank is getting so densely packed with corals. Hey Kevin thanks! I want to try to use Facebook a bit more for business so the watermark is just to keep my photos identified as mine. Well Mark, coming from the man behind Z’s paradise, that is a huge compliment. Thank you very much. Likewise on the source of inspiration! Hey Sahin, thanks for dropping in on your thread! you got me to start it. Thanks for the kind words. I’m hoping you’ll be posting just as good shots in the near future. Hey Scott, thanks! Appreciate it. I have more macro compositions..
Here’s one.. I’ll try to post the rest later today..
how do you do it so that acros do not burn each other being so close together? Amazing photos! Absolutely love the pink matrix, drooling over it! Hi Matt, Your tank is always so gorgeously colourful. Just love to see more pictures of it. Hey Sensei, thanks! I have found that all corals are different. Some are extremely aggressive and destructive while others not at all. Sometimes one coral will burn the other way back and sometimes corals will just grow into each other and nothing happens. When I have an aggressive coral like the red no name, I have to trim all the branches that head towards weaker corals. But if corals meet and nothing happens, I let them go.. Thanks! Taking the pictures is as much fun as growing the coral. That pink matrix is very photogenic! Hey Bernie thanks! Well, I happen to have a few more shot from my last climb on the ladder so, here ya go! Fox Flame and no name. Not sure what this is.. So I think that pretty much does it for the latest photodump! You SPS are so healthy and color vibrant with lush flesh they almost look like flowing LPS. Thanks Wally! They are doing pretty well right now. On the evansi, they'll eat big chunks of food. I used raw frozen scallops and shrimp. It worked well for me with randalls and evansi. I trained them in QT which made it easier. I don't buy you have to feed that tiny food to small/mid sized anthias.......they have huge mouths for their size. It's just a matter of training. I echo what has been said already about the latest photos. The common coral names you use don't mean anything to me, but two of my favourites in this set are the Acropora in the first picture and "not sure what it is". One question: why have you started to add a watermark to your photos? The new anthias went into the display with the other anthias. The smaller ones (which I should never have bought) have already died. They were about an inch long.. they would only eat the smallest particles. My larger ones eat anything including flake and pellets.. how big were the evansis you were working with? I assumed that adding new anthias to established ones would actually help them emulate the behavior of the established fish and get them eating quickly.. Thanks! Selago.. I will look that up..
Hey Bulent, thanks! unfortunately I am terrible at scientific names for corals and ID ing in general. I started adding a watermark because I am trying to have a presence on Facebook- locally- to promote by business more. I do aquarium maintenance full time - fresh and salt- and because Facebook is so public and to associate my photos with me and my business, I just figured I’d start ‘owning’ my photos.. I want to begin detailing my maintenance practices and showing some of the other tanks I take care of.. so it’s just a way of branding my photos, I suppose..
. This side is really growing in because I haven’t messed with it too much. 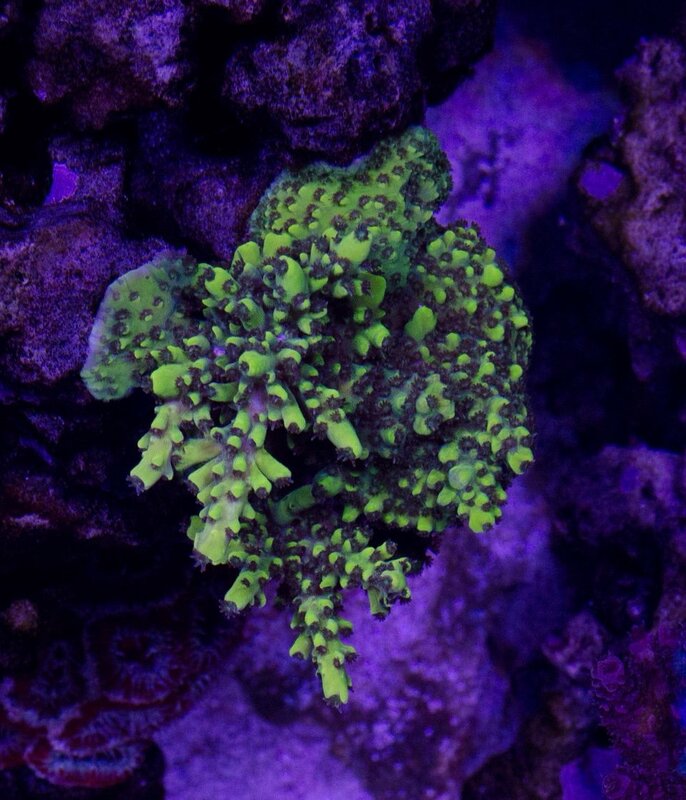 The other side keeps having corals pulled out and replaced with new frags.. I can’t help always trying to find a different/better colour..
Hey Mike. Thanks, man! maybe I should go international! Beautiful Matt, just crazy beautiful. Amazing looking tank man! So vibrant in color. Mark, Corey, Jordan, thanks guys! I really appreciate the comments. Feels good to get the positive feedback. Sometimes, I look at my tank and go ‘yeah, looking good.’ Other times I’ll have a look and say ‘what the hell have I got here?? Looks aweful.’ Maybe it’s just my wussy moods that do that!! I guess I pay more attention to the corals that I am frustrated with..
when I’m taking pics I obviously ignore those ones. Just noticed I have a mediocre shot I never posted.. This is a cultured Gold/green something and a steel grey piece that is growing well.. that’s an old encrustment of habanero between..
And another habanero close up..
Last edited by reefmutt; 11/11/2017 at 02:23 PM. Do I spy a Darth Maul Porites in the last picture? Scott, you get the prize for eagle eyes! Yep. Been in there for a few months. Not doing much however. I’m just leaving it alone for now. Wow. Looks very similar. Could very well be the same. How long have you had it? Here- I edited your shot a bit to remove the blue.. looks even more similar.. I have a question for you: I see you use tapatalk. When you post pics are they stored on your phone? I’ve been using postimage. Com to host my pics but I know tapatalk will great it’s one link from a computer. I pretty much use my phone exclusively for going on line and I’m not sure the mobile version of tapatalk can support the third party hosting link..
Last edited by reefmutt; 11/12/2017 at 07:59 AM.